The best thing about the weather in Scotland is that whatever you write about it will probably be true at some point in the year. And it’s all because of where Scotland is – sticking out into the North Atlantic. You could think of the skies above Scotland as a battlefield, where the prevailing south-westerlies with their mild airs off the Atlantic Ocean meet the more stable air of the continental European land mass. The resultant mix means the weather in Scotland never gets very warm or very cold. It’s just a cool temperate climate. Ho-hum. Best pack a light waterproof, just in case. Especially if you are heading to the West Highlands. Oh, unless the forecast is for an east wind, in spring. In this case, the west will be dry. You see what I mean? Even explaining the weather in Scotland can be very complicated. Anyway, let's start with a reassuring picture of what sunshine does to the colours of the Outer Hebrides - in this case, an Eriskay pony on Eriskay, towards the south end of the Outer Hebrides, who looks as though he (?) is enjoying the Scottish weather. But how my heart used to sink when I had to write those earnest descriptions of Scotland weather for promotional area guidebooks. I used to catch myself writing the word ‘moisture’ instead of ‘rain’ because it somehow sounded, well, drier. But you can’t blame Scotland’s tourism industry for not wanting to dwell on the weather in Scotland because – and there’s no way I can say this gently – it definitely rains a lot in some parts of Scotland, especially in the west. Time it wrong and an Atlantic weather front will slice the tops off those soaring mountains, and a grey wet curtain and a wind off the sea may make you seek recreation indoors. The upbeat part is that if you expect the worst, then, when the weather in Scotland shows signs of improving, you can relax and enjoy the glorious interplay of cloud and light, and the mist rising on the crags, and all that stuff. Oops. I knew I would break out in brochure-speak at some point. One of our Isle of Skye pages illustrates the fast changes which can occur, on a day when Portree, the island 'capital', looked especially miserable in the rain. But only a couple of hours later, an easy drive to the north, and the mountainscape of the Quiraing was bathed in sunshine. April showers on the Moray Firth coast. This is one of the very driest areas of Scotland. Nevertheless, on that spring day the south wind still managed to push these fierce-looking clouds down towards the sea. Short sharp downpours, clearing in between. visibility good, cloud effects even better and not too cold. yes, honestly. You can’t. The oft-quoted description of ‘four seasons in one day’ is an exaggeration - though a favourite saying of couthy tour guides, landladies and lazy tourism brochure writers – but there are certainly plenty of statistical differences in rainfall, sunshine hours and so on, to be noted even within comparatively short distances, because of the varied landscape of hill and glen. Be optimistic – the Scots usually are about their weather. This is the only explanation for why Fort William, the West Highland route centre and bustling town in the shadow of rain-catching Ben Nevis, successfully brands itself as ‘Scotland’s Outdoor Capital’ – in spite of being one of the wettest places in Scotland. Anyway, 'Scotland's Indoor Capital' as a title would be an admission of defeat, wouldn't it? Basically, Scotland has what geographers probably call a cool temperate maritime climate. However, there are exceptions to this cool-ish temperate flavour, if you believe what you read in guidebooks. One climatic freak in Scotland’s weather (apparently) happens specifically at Inverewe Gardens in the north-west Highlands. Many guidebooks describe the beautiful gardens there as ‘semi-tropical’. It’s all to do with the Gulf Stream – strictly speaking, the North Atlantic Drift – bathing the coast with its beneficial warmth. OK, so it’s on the same latitude as Labrador, but just because it doesn’t freeze up in winter does not make it semi-tropical. However, the real issue with Scotland's weather is the tendency of the 'down-south' media to over-generalize and lump a single weather forecast for the whole of Scotland - or to assume that specific or fairly localised weather events are much more widespread than they are. Hence, for example, in the winter of 2015, the terrible flooding in the north of England, centred on Carlisle and Lancaster and England's Lake District but spreading out further and certainly into parts of the Scottish Borders, was widely reported in the media as a disaster for 'the North of England and Scotland'. Hardly a drop of rain fell on us Scots in the coastal fringes of the Moray Firth and we watched the tv news in horror. However, having said that, later in the same winter, some northern rivers, such as the River Dee, caused serious flooding events (for instance, in Ballater). All of this is a reminder that Scotland often gets highly localised weather - because of its varied terrain and of where it lies off the main land masses of Europe as outlined above. And this brings us back to our starting point: that it's difficult to generalise. Barra is part of the Outer Hebrides, down at the south end. (We have a page on Barra if you want to find out more.) Now, in March of 2018, the infamous 'Beast from the East' arrived, dumping snow on swathes of England down there, as well as on bits on us as well. The papers were full of it, as we generally aren't very good with snow. But hear this: while the easterlies brought the serious weather, Barra, way out west was, of all things, dealing with moorland fires because it had been so dry - and it wasn't the only place in the west. BBC Scotland gave it a mention but otherwise this extreme example of weather contrasts over comparatively short distances was lost in the media preoccupation about the end of civilisation because it was snowing. 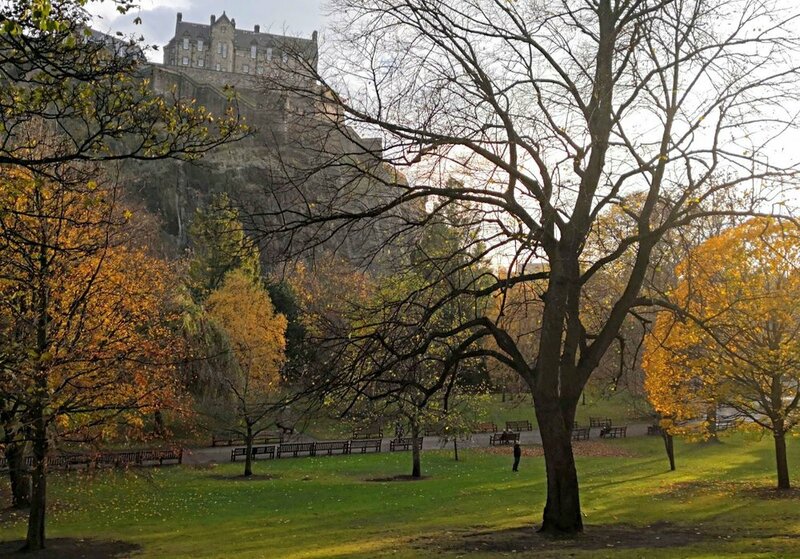 It’s a lovely calm autumn day in Princes Street Gardens, Edinburgh. Even in November you can chance upon weather that’s ideal for exploring the city. OK, so beware the media stereotyping that goes on - but bear in mind that, for sure, our weather is a bit unpredictable. That makes packing for the trip a little tricky. When deciding what clothes to bring on holiday, pack for maximum flexibility. But as well as that waterproof, think about layers rather than just one thick garment. Heck, I'm editing this page and adding this sentence three days before the shortest day in December - and it got to 14.5 degrees centigrade today, just ahead of midwinter. And that brings me neatly on to some thoughts on the weather in the north, in the Highlands, in particular. Thinking about Scottish Highlands weather - as opposed to general observations on Scotland's climate - then, yes, I’ve had my share of promoting the ‘four seasons in one day’ copywriter’s cop-out cliche. Truth to tell, I used to hate having to write that ‘pack flexibly and prepare for anything’ stuff – though it was probably sound enough advice when it came to describing the ever-changing Highland climate. In any case, when you get north of Ullapool, Scottish Highlands weather forecasting often doesn’t seem to apply – that’s the impression I’ve got over the years, anyway. In any event, it’s never easy to make a generalisation about Scotland’s weather, but this is taken to extremes the further you go north and west into the Scottish Highlands. Evening clouds forming over the peaks of the Fisherfield / Letterewe area, viewed from Laide of Reiff in the North-West Highlands. These are pics taken when the general forecast would be ‘rain or showers in the north-west’. But the coastal headlands and the high peaks mean that nothing is that simple. (left) The sun is glinting on the water of Achnahaird Bay, but the clouds are clinging to the not-terribly-high peaks of Inverpolly – definitely a day when the coastal headlands are getting better weather. The hilltops really do catch the weather – sometimes you just have to do a coastal walk and hope the weather passes over quickly. This doesn’t always work! These pics were all taken north of Ullapool, the main town for the North-West Highlands and which is only an hour’s drive north of Inverness. We like this large village - there are plenty of nice places to stay - as it is also the gateway to the Outer Hebrides. With a westerly airflow, Scottish Highlands weather comes in from the Atlantic and you’re going to get wet from time to time but, in between the showers, the seascapes and the skies are just pure theatre. You didn’t come here for a sun-tan, did you? That's the secret of our fast changing weather. It'll change eventually - or sooner. It's great for dramatic lighting effects - you'll get some great pictures. Think about it as a little adventure. So, now you know about the weather in Scotland, you will find some more weather pictures in a kind of almanac on our best time to visit page.